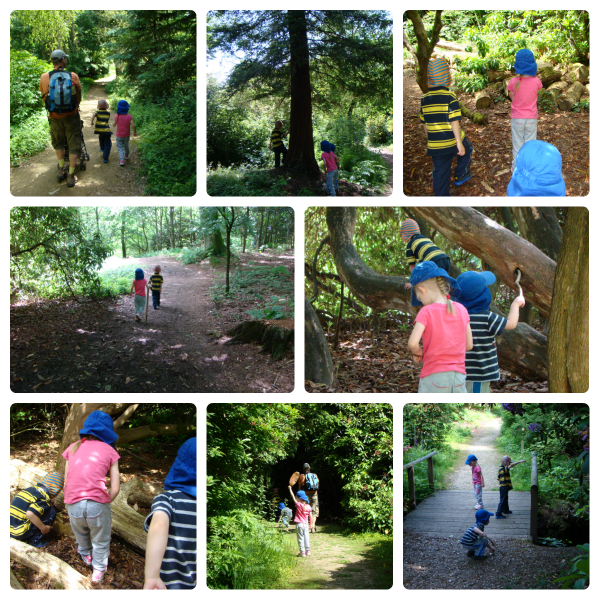 Today we drove to Leith Hill to take part in the Big Nature Weekend/BioBlitz event, run by the National Trust and Surrey Wildlife Trust. Leith Hill is the highest point in Southeast England and is set within the Surrey Hills. It is within an Area of Outstanding Natural Beauty and is also designated as a Site of Special Scientific Interest (SSSI). The event was held in the Rhododendron Woods, a beautiful landscape created by Caroline Wedgwood, the sister of Charles Darwin. The bioblitz began yesterday evening, when they started with moth trapping and bat surveying. This morning, bright and early, they began trapping small mammals and investigating the moth traps. 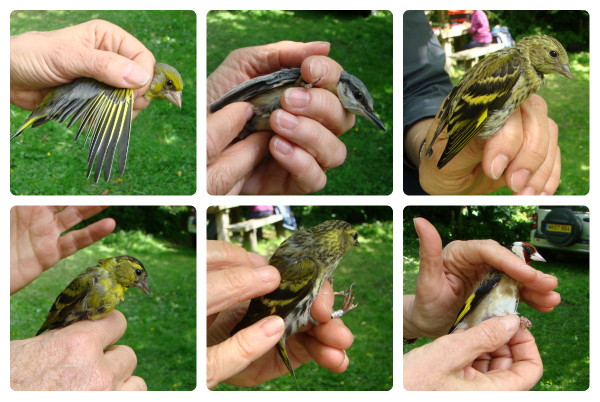 They also started bird ringing. 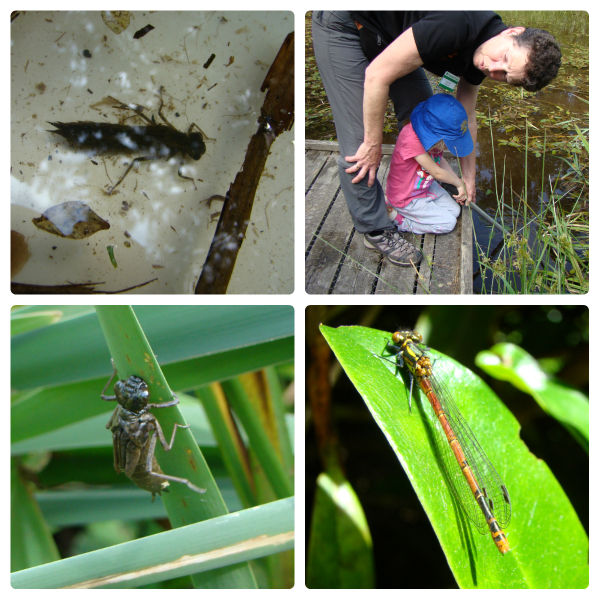 Of course, we weren’t up late enough last night, or early enough this morning to join in with these activities but we arrived at lunch time today and filled the next four hours with bugs, moths, newts and much, much more! Our first stop after arriving was the main tent, where they had all the moths and bugs in containers, nets or on egg boxes. We saw a huge selection of different moths, from small to really huge! Top left: Poplar Hawkmoth. 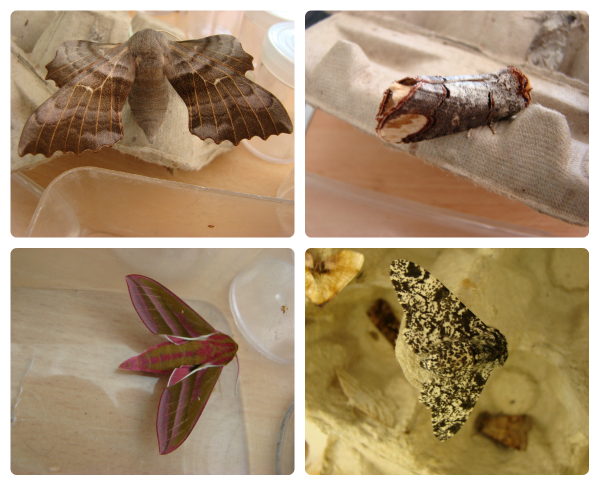 Top right: Lime Hawkmoth. Bottom left: Elephant Hawkmoth. Bottom right: Peppered Moth. These moths pictured made the biggest impression! I was amazed at how beautiful I found the elephant hawkmoth, and Jasmine really liked the peppered moth. 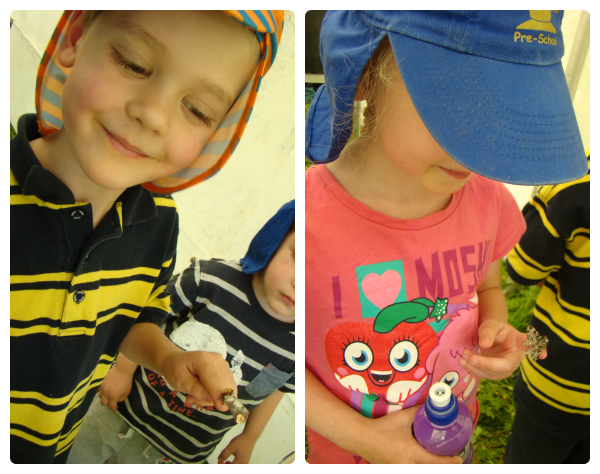 Both Thomas and Jasmine got to hold one – Jasmine held a peppered moth and Thomas held a lime hawkmoth. 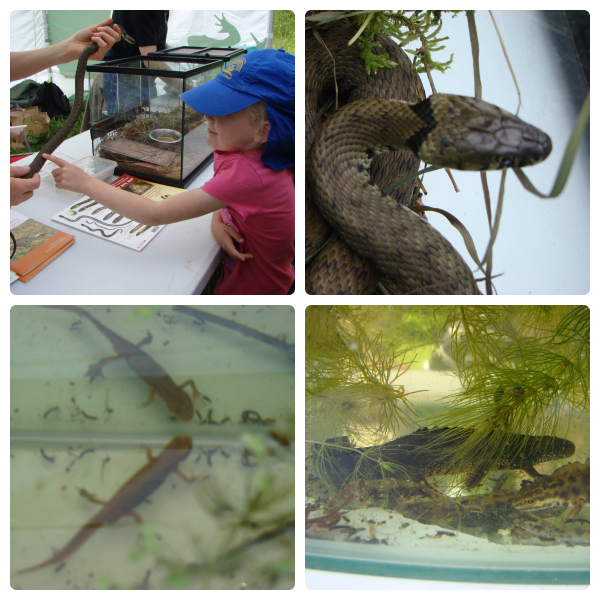 Next we went to the Amphibian and Reptile Group stand where they had newts, snakes, slow worms and tadpoles to see. For most of us this was the highlight of the day because we got to touch a grass snake and a slow worm, and they had a great crested newt in their newt tank! They also had an Adder, which Jasmine asked if she could touch. We quickly explained that it probably wasn’t a good idea because adders are poisonous! The kids spent a long time looking at, and stroking, the snake and slow worm while I chatted about great crested newts. For anyone who doesn’t know, due to enormous declines in range and abundance in the last century, the great crested newt is strictly protected by British and European law. They had to have a license just to have them on display in a tank today! So it was a real privilege to see it. After reptiles and amphibians we went to see the birds next. They were catching the birds in large nets and then measuring, sexing, ageing and ringing them before releasing them again. We were lucky enough to get there just as they were coming back from checking the nets. One of the lovely volunteers brought each bird for us to look at once they had collected their data and talked to us a little about it before releasing it. We saw a greenfinch, a nuthatch, 3 siskins and a goldfinch. Once all the birds had been released we decided to have a go at the trail around the woods, so we got our map and set off. The rhododendron woods are beautiful, full of life and so much to see. As we did the trail the kids loved looking out for all the markers and answering the questions. The trail was really well thought out and perfect for the kids. Ben was getting a bit tired so he spent some time in the buggy, but mostly they all explored and discovered and chatted and explored some more! Our final activity of the day was pond dipping. We saved the best till last! The kids all got stuck right in, and this produced Jasmine’s highlight of the day because she saw the long-awaited dragonfly nymph. She has been waiting and waiting all year to see one so she was very happy! Again we got chatting to the volunteers and they were all wonderful with the kids. They let both Thomas and Jasmine hold the newts and move them into the pond dipping trays. They talked to them about what they had found and were just generally lovely. Sadly, by this point of the day the camera was running our of battery so I only got a few photos. I think Thomas and Jasmine could have stayed by the pond, dipping and chatting all day! We had several last go’s before we finally managed to get them away and back to the car! We all had a great time today and I am really pleased we went and joined in – we almost didn’t go at one point. We will definitely be going back to Leith Hill to see more. How wonderful for them to put on such a fun and informative event for the whole family to enjoy at a stunning location, even the sun made an appearance! The pictures of the insects and animals are great and how lovely that you were able to study the birds up so close. Thanks for sharing your outdoor adventures with Country Kids. Oh wow, this is *proper* country kids at its best! I’m astounded at all the different animals that you saw, and the exploring a pond is great work. I’d love it if you linked it up to my National Trust 50 Things To Do Before You’re 11&3/4 linky (on the Natural Childhood tab on my blog). wow I live not too far from there and have never got around to going there, I will now after seeing this for pond dipping! Oh yes, do go! It is such a beautiful place. The hawker dragonflies are just starting to climb out and emerge too so July will be a great time to go. They are fantastic photos, looks like such a great day.